It's gotta be easy to build, but still protect humans from temperature changes and radiation. If you believe the hype, it may happen in just a few decades. Elon Musk anticipates that SpaceX’s BFR (big f–king rocket) will take its first handful of passengers to the Red Planet by 2024 — if everything goes according to plan, that is. Mars One’s crew, which will take up permanent residence on Mars, is slated to launch by 2031. NASA is aiming for a similar mission by 2033. Getting humans there is hard enough. But surviving there, especially over a prolonged period? That’s a whole other question. A structure on Mars would have to withstand intense solar radiation and massive daily temperature changes, and provide a pressurized environment inside for humans to inhabit over a prolonged period of time. Weight and space limits aboard the rockets that will get us there will make the design task even harder. 3D printing the habitat seems like humanity’s best bet. The Martian surface comes with its own challenges, but back on Earth, 3D printing technology in home construction is proving to be very promising. A 3D printer with local resources from the surface as the “ink” would mean that astronauts wouldn’t have to fill up precious cargo space with building materials. Plus, the reduced weight would make Mars colonization substantially less expensive. So NASA held a contest for the best 3D-printed habitat that might actually work on Mars. That was in 2014. The first two phases of the project required teams to submit renderings, and come up with material technologies. Now, four years after launching the contest, NASA has narrowed the finalists to just five brilliant designs. The fives teams, which hail from a handful of American universities and companies that specialize in architecture or construction, have now come up with an entire structure that takes advantage of autonomous 3D printing on the surface of another planet; they will also share a $100,000 prize. For the next phase, each team will have to create a third-scale model of their designs. Team Zopherus from Rogers, Arkansas came up with the idea of mixing “Martian concrete” using locally available materials — ice, calcium oxide, and Martian rocks. A huge metal dome houses the concrete mixer and 3D printer. The dome protects the structure the printer is constructing from the harsh environment. Once the printer is done with a section, it lifts itself up, and repeats the process elsewhere. The resulting habitats are hexagonal, made of finished concrete that the team claims would be able to withstand the harsh local climate and absorb enough radiation to protect humans living within. The metal dome that houses the printer, plus any air locks and windows for the final construction will have to be shipped separately from Earth. 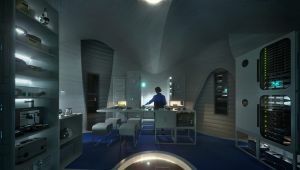 The team from New York tried to inject an “element of humanity” into its habitat design to create a “credible and evocative habitat with an alien yet familiar beauty” according to the team’s website. The habitat, dubbed Marsha, is cylindrical to maximize usable floor area and pressurization efficiency. Multiple floors also means inhabitants won’t end up murdering each other (that’s a real concern), offering each activity or group of people their own closed off space. Sliding bearings on the floor allow the walls of the habitat to “breathe” as it expands and contracts as the outside temperature changes. There are two layers: an outer shell to keep the harsh environment out, and an inner shell that houses people. The outer shell is made out of a reusable thermoplastic that is mixed with local rock fibers to reinforce it. This type of plastic, called PLA, is great for this application because it doesn’t expand or contract as much as other plastics when temperatures drop or spike. The team from Jackson, Mississippi designed a habitat that has a prefabricated core, which the lander plops down on the Martian surface. Once it lands, the core extends a giant print arm that 3D prints the oval habitat’s foundation, then its walls. The habitat’s exterior shell has carefully-designed openings that allow sunlight to reach the inside. A gap between the outer shell and the interior core provide space for lush garden that can help filter the air inside. The team from New York balanced on the habitat’s ability to shield inhabitants from radiation while still allowing sunlight to filter into the design’s interior. The team partnered up with Apis Cor, an (Earth-bound) construction company that has already 3D-printed entire buildings using a special type of concrete. In this model, the inhabitants live inside a pair of “inflatable volumes” that can be deployed to the Martian surface before the crew arrives. A 3D printed shell, made of rough loose rocks, would shield the inflatable habitats from radiation. Like previous team, Northwestern’s team designed an inflatable pressurized vessel that houses the 3D printer. The outer shell would be printed out of resources available on the crust nearby. The layout focuses all “wet rooms” (kitchen, bathroom, and lab) along one side of the habitat to concentrate plumbing and other mechanical features to one area. NASA’s HI-SEAS experiment, which simulated space exploration, informed the proportions of the different rooms.